A really quick dinner that’s great served with brown rice, baked potatoes or some toasted wholemeal pitta breads cut into soldiers and accompanied by some hummus. Heat the oil in a big pan set over a medium heat and fry the onion and garlic for 5 minutes, stirring regularly to ensure they don’t burn. Add the sliced leeks and peppers along with the salt, cumin seeds and chilli and fry for a further 5 minutes. 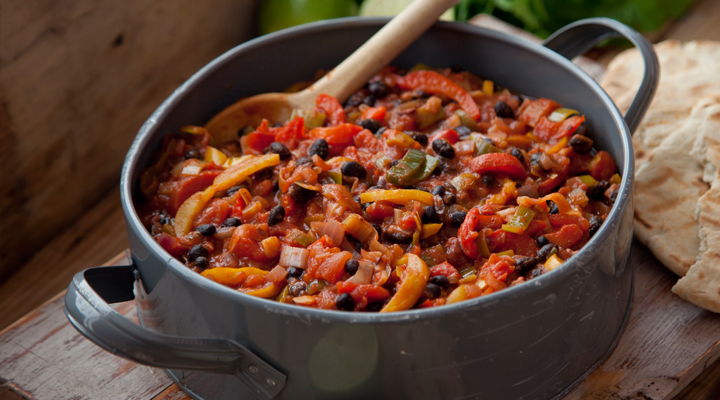 Add the tinned tomatoes and black beans to the pan along with the tomato purée, honey, ground coriander, ground cumin, paprika and black pepper. Turn the heat up to high and bring to the boil, then reduce the heat and leave to simmer for a further 10 minutes. Stir through the coriander and lime juice. Taste and season with more salt and pepper if needed. Absolutely wonderful, hearty food. I doubled the recipe to share some with some friends. This chili is delicious and I will definitely make it again. Love this recipe ,so easy yet tasty & wholesome . Tastes even better the next day .